There’s been an interesting recent surge of interest in exhibiting religion in museums, particularly history museums. I’m part of an NCPH Working Group this year on Religion, Historic Sites and Museums. The National Museum of American History just had a symposium on religion in early America, with an exhibit on the topic to open in 2017. Colleague Chris Cantwell has been beating the “public history of religion” drum for some time, and there’s a moderately active Religion in Museums blog. There are some interesting parallel challenges in interpreting the history of religion and my own bailiwick, the history of technology. In fact, I think the technique of “blackboxing” the rightness or wrongness of an idea can be very useful for both fields. A excellent example of this is an exhibit from the 1970s that presented the beliefs and cultural contexts of religious people with great empathy. I decided to take a look at religion-themed exhibits at my own institution. In 1979, OMCA hosted a exhibition called That Old Time Religion, which evolved out of an art experience Eleanor Dickinson developed at the Corcoran Gallery in 1970. Starting in the late 1960s, Dickinson visited Pentecostal, Holiness, restorationist, and other Spirit-filled churches across Appalachia (and later in California) as an artist-anthropologist. She documented her research through photography, a/v, drawing, (black velvet) painting, and collecting. (Dickinson has an amazing talent for line; she is an artist who can capture faces and emotions vividly in a simple curve.) This documentation became the basis for the Revival! concept, a museum experience that used artifacts and stage setting to invite visitors into a sense of being present at a revival service or tent meeting. 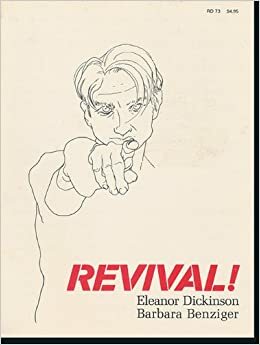 I haven’t found any photographs of the exhibit, but the accompanying book, Revival!, offers a good sense of the gallery experience at the Corcoran. Eighty-four drawings, many larger than life, lined the walls, but each drawing was titled with the first few lines of a hymn which might be sung at a revival. In the center of the room folding chairs were arranged as if in a revival tent. A Bible rested on a lectern facing the “congregation,” and above it a twelve-foot red-and-white banner proclaimed: LORD SEND A REVIVAL. On the folding chairs were hymnals and paper fans. The hymnals were old, most of them long out of print. It was a warm night–appropriate since most revivals are held in the summer–and many visitors sat and fanned themselves. Some of the fans were old, some new. On one side of each was a religious picture, on the other usually a prayer along with an ad for a funeral parlor in a small southern town. In an adjoining room were displayed various other artifacts such as posters and flyers announcing revivals, embroidered samplers, bumper stickers, and road signs, all bearing religious messages: PREPARE TO MEET GOD. JESUS IS COMING SOON. From a speaker system the authentic sounds of a revival meeting filled the gallery. The artist had also collected tape recordings of hymn singing, preaching, prayer, testifying, speaking “in other tongues,” and–as is often the case in a revival tent–crying babies, barking dogs, and the sudden thunderstorms common to the Appalachian Mountains. A previous opening had been held at the Dulin Gallery of Art in Knoxville, Tennessee. There, as in Washington, some came to look at art work and others to worship. Students from the state university called it a trip or a happening. Others wept. Sometimes a visiting preacher delivered a sermon. Later REVIVAL! toured the country, and it was always viewed differently by different groups of people. The artist always insisted on one thing: that is was more than a show of drawings. Perhaps the truth is that by exhibiting the portraits of her people in the setting in which she found them, Eleanor Dickinson had recreated a revival. Could a show like this tour today? Would it be seen as exoticizing on the one hand or distasteful on the other? Or would visitors today feel the same power the writer in the catalogue found, based on the absolute integrity and sincerity with which Dickinson portrayed her subject-collaborators? A lot has changed in American public cultures of religion since the 1970s, including an increasing ignorance about others’ religions, but interest in the varieties of more extreme religious experiences remains high. At OMCA the show was exhibited in the Hall of California History under the auspices of the History Department, rather than as part of the Art Department’s offerings. What difference did it make for the show to be exhibited as history versus as art? Is religion in the museum more acceptable when presented as art? Revival!/That Old Time Religion gives us rich material for thinking through the challenges and possibilities of exhibiting religion.